Folks have been growing their beards just for this day. 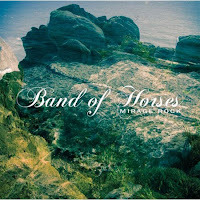 For it's today that Mirage Rock, the new album from Bands Of Horses, gets released. The group kick things off with "Knock Knock", the first single from the album. It's a hook-laden pop rock number, and the closest Band Of Horses have ever come to producing something that could be classified as bubblegum. The volume on the console was turned all the way up for the frantic, clattering "Feud". The band's country side comes through on the delightful "How To Live". We're treated to a twangy shuffle on "Dumpster World" (think a more uptempo "Harvest Moon"), until it explodes into a Crazy Horse grind. Bridging the rock and roots world is "Electric Music". It's a southern-tinged, roadtrip-worthy rock n' roller. The past has not been left behind, as tracks like "Everything's Gonna Be Undone" give a nod to Band Of Horses' vocal harmony-rich history. Along those same lines come to breezy "Long Vows" and "Shut-In Tourist", a far-too-mellow folker with a slightly grating swirl underneath. Less an album and more a collection of individual songs, it sounds as though Mirage Rock is a bit of a plate clearer for Band Of Horses. It sounds like a band getting rid of all of the songs they had lingering around before they embark on a completely new direction. Best tracks: "Electric Music", "Feud"